Did a great ride out to Great Brook Farm today with a very nice Ciclismo group. We stuck to a moderate 13mph pace, so it was all very relaxed. Perfect for an Indian summer day like this! Plenty of leaves everywhere, temperature peeking into the 60s! For our snack at Great Brook Farm, I brought a pannier of Kim's famous apple hand pies and a big thermos of hot mulled cider. 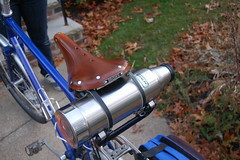 In addition to my clever handlebar bags doubling at compact color-coordinated panniers, I made use of the eyelets on my saddle and a pair of good old leather toe straps to carry the thermos! Toe straps are a completely underappreciated cycling accessory! I had a perfectly delightful coffee & lunch last week with Trinity Italian professor Dario Del Puppo and student Jamie Merolla (class of 2010). Both kindred spirits: keen cyclists and Italophiles, and Dario in particular is completely in tune with my velo-sensibility: he rode a beautiful vintage Fat Chance fixie to our rendezvous, and he has a great variety of steel bikes in his stable. I'm looking forward to riding with them in the springtime, if not before!